Judith is a long-standing member of staff who first came to Barton Lodge in 1998 as a work placement student whilst studying for her Animal Care Diploma at Oaklands College. On completion of her Diploma she joined Barton Lodge full-time in 1999. 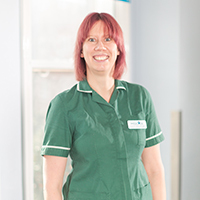 She undertook her veterinary nursing qualification and is now a Senior RVN. Judith is also a Clinical Coach which allows her to train and assess student nurses. Judith helps to organise and run the Nurse Clinics and Puppy Parties. She also has the main admin responsibility for dealing with the Pet Insurance claim forms. Judith has a cat called Squirt, whom she adopted as a stray and more recently acquired another cat, Frank when he was a kitten. She also has a horse called Letty.